Getting your discount is easy. Just use our FREE mask fitting tool! Simply choose your mask, fill in your details and we will SMS you to start your FREE mask fitting! Once you have your correct size, purchase your mask for $195 and get entered into the draw to win a Lumix camera or Visa gift card! Buy now before this price discount disappears! 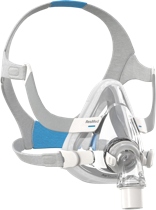 ResMed's latest compact full-face mask for CPAP sleep apnea therapy, with flexible elbow. Exceptional fit, comfort and visual freedom. Innovative technology for a simple, effective, user-friendly experience. 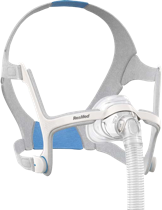 ResMed's latest compact nasal mask for CPAP sleep apnea therapy, designed to fit everyone. Comfort and freedom through innovative technology. Easy to use & unobtrusive. Our mask sizing tool is free use and you're not obligated to purchase after using it... though we hope you will! Scroll down for Mask Fitting FAQs. Great Choice! You’ve chosen the ResMed AirFit F20 Full Face CPAP Mask. You will receive an SMS from +614 2622 8577 shortly. Please complete the process to get your discount link. Plus - win a Lumix ‘selfie’ camera or a gift card! 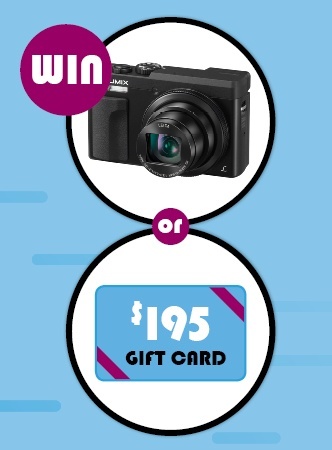 Purchase an AirFitTM F20 for $195 and go into the draw to capture life’s big moments with a LumixTZ90 selfie camera, or a gift card worth $195. 1) How does the Mask Fitting tool work? Our mask fitting tool can measure the dimension of your face via SMS/MMS. Once you have provided your details (email and mobile number) using the form provided, the tool will automatically send you an SMS/MMS to start the Mask Fitting process. The tool then will ask you a series of questions and to take a selfie using your mobile phone's camera. Our artificial intelligence will then measure the dimensions of your face and recommend the most appropriate mask size for you! Note - You will need a mobile phone with a front-facing camera! 2) Does it matter how I take the photo? 3) How much does the Mask Fitting tool cost? The tool is completely free aside from the standard SMS and MMS rates that your phone carrier charges. 4) What should I do if the Mask Fitting tool isn’t size me? Unfortunately the tool doesn’t work for everyone. If the tool still doesn’t size you after a number of attempts please contact your local CPAP Australia store to be sized by one of our friendly staff. 5) I lost my recommended mask size, how do I get my size back? There is no way to retrieve the size you have already received. To determine which mask size you need is best again simply use the tool a second time. 6) How long should it take to receive a reply? The service should reply within a few minutes of you sending a message. 7) I haven’t received a reply from the tool? 8) What if I already know my size, should I still use the tool?